Our wine is stored in oak tuns made in the 1950s, stainless steel tanks and 228 liter oak casks. Casks are used for certain vintages for which the contact with the wood and the better permeability to oxygen contribute to the flavour during aging. 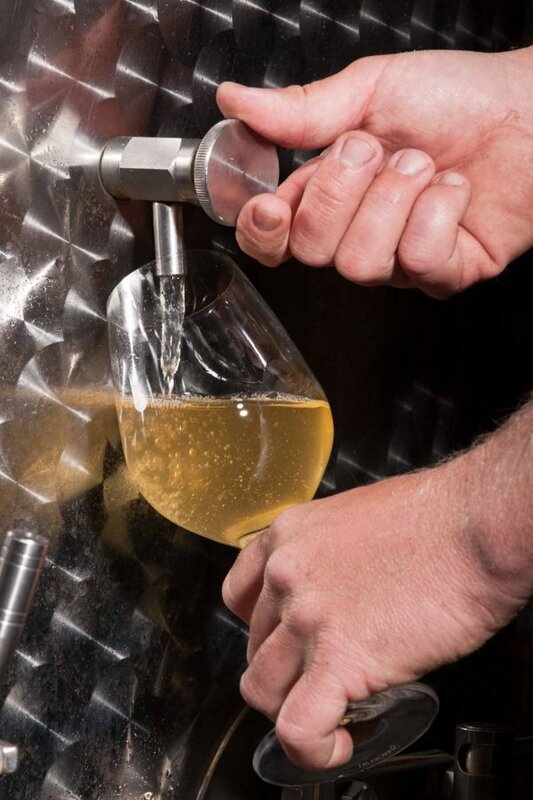 Our job is to monitored the grape juice closely during its transformation into wine. It is tasted and the alcohol level is checked regularly. In order to obtain the wine's full potential and character, we never employ oenological additives, we never add sugar and we use exclusively the yeasts naturally present in the containers and on the grapes. The grapes collected by hand are placed in tanks and taken to our press. It is most important that the grapes arrive intact in order to avoid any risk of oxidation of the juice. The grapes are pressed very slowly, over 6 to 8 hours, to extract their sugars and juice progressively. 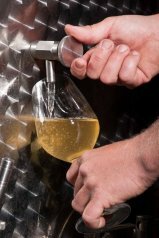 The must runs by gravity into a cleaning tank where impurities are separated from the grape juice. The must is left for 12 to 24 hour to allow the impurities to fall to the bottom of the tank, then the clear, purified juice is transferred to fermenting tanks. The fermentation starts spontaneously thanks to the action of indigenous yeasts, either in a stainless steel tank or in an oak tun or cask. The process continues for 3 to 6 months after which the wine is racked to separate it from the coarse sediment. It is then matured on fine lees until bottling. During this stage, which is absolutely decisive in terms of quality, the wine further develops its complexity, flavour and consistency. At regular intervals during aging, the wine is sampled in order to judge its quality and evolution. Our wines are bottled twice a year, in May and August according to their evolution. We use only natural corks. The bottles are then stored in cool cellars until they arrive on your table.